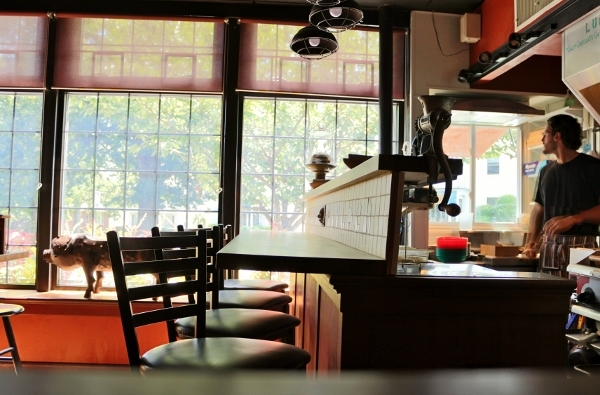 Providence was recently named the 8th Snobbiest City in America by Travel + Leisure Magazine. Although we Rhode Islanders certainly don't have a reputation for walking around with our noses in the air, we definitely have an attitude when it comes to incredible food. 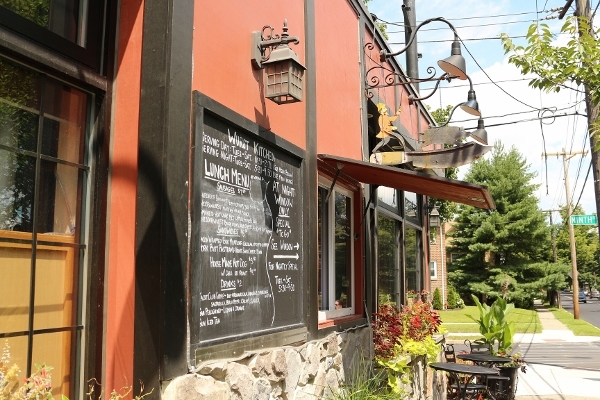 We take food very seriously, which is evident from the number of farm-to-table, locavore, and seasonally changing menus at many restaurants around Providence and neighboring areas. 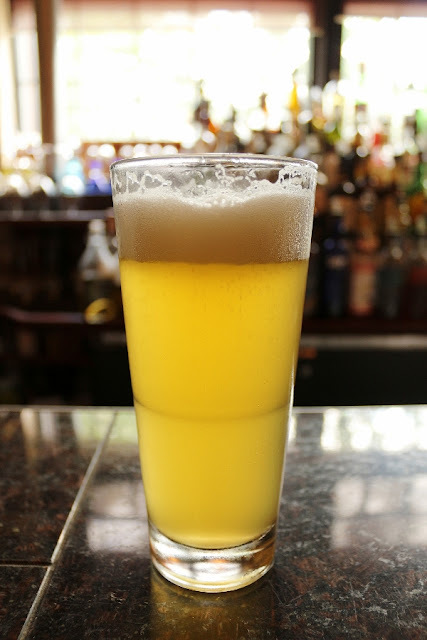 Many restaurants often boast ingredients that are produced locally and artisanally, whether they are cheeses from Narragansett Creamery, calamari and clams from Point Judith, or fresh veggies from any number of local farms. 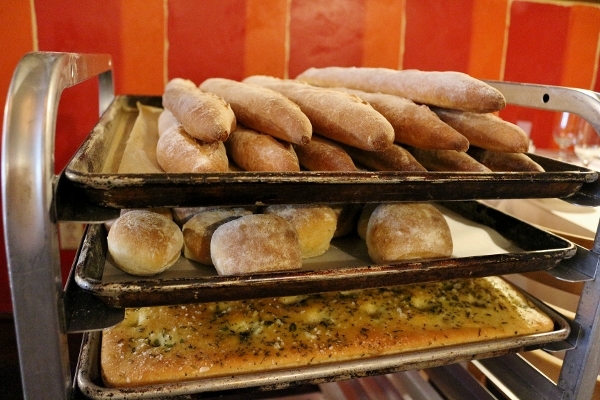 One of my favorite discoveries as of late is Chez Pascal's Wurst Kitchen. 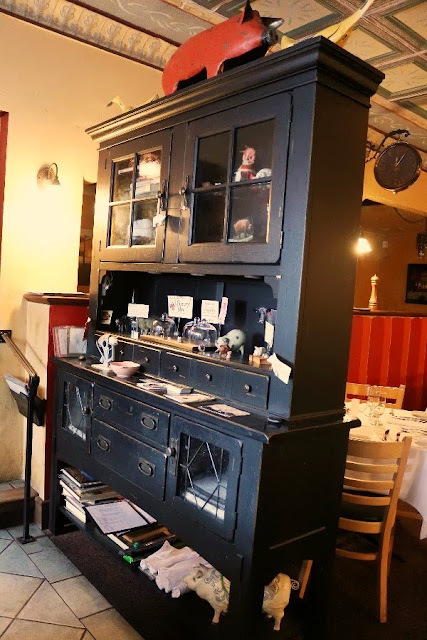 Chez Pascal is a small French restaurant with a seriously local edge. 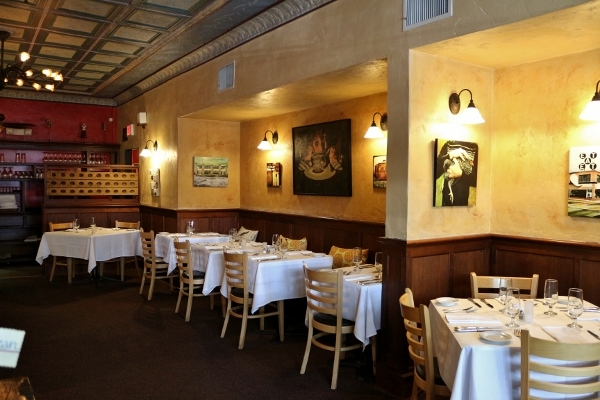 It opened its doors in March of 2003 to owners Matthew (Executive Chef) and Kristin Gennuso. 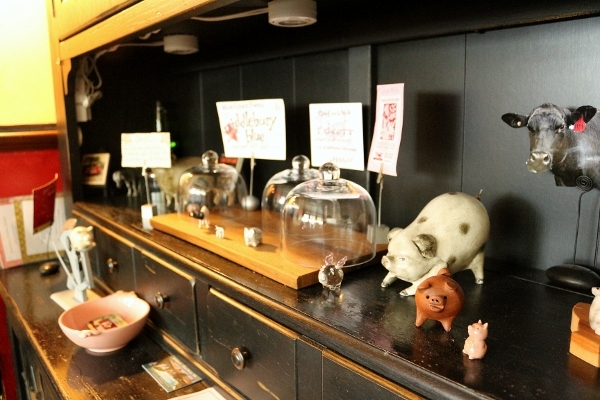 After years of popularity, especially focusing their energies on a love and appreciation for all things pork (there are countless depictions of pigs both inside and out of the dining room), Hewtin's Dogs Mobile Food Truck was born in 2008. 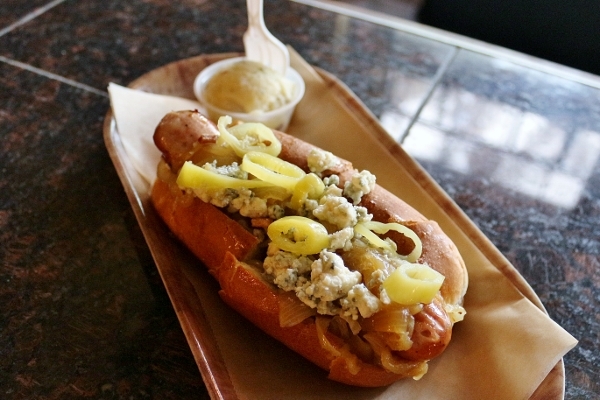 It took Matt's love for making artisanal sausages and cured meats to the next level, offering gourmet dogs at reasonable prices. 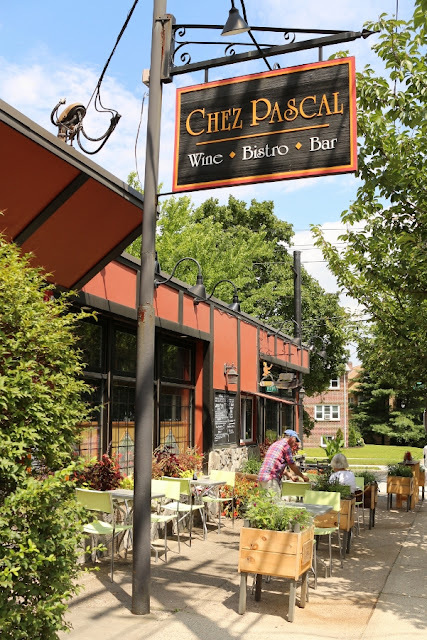 A year ago, this concept expanded to include a small open-air kitchen adjacent to the Chez Pascal dining room. It's aptly called the Wurst Kitchen and usually features 4 homemade sausages on each daily menu, along with a special wurst of the day, a couple sandwiches, and most recently has grown to include a few fantastic desserts as well. Ever since my first visit to the Wurst Kitchen and its walk-up counterpart the Wurst Window (for outdoor dining and takeout), I have been revisiting regularly to explore more and more of the ever-changing menu. No two visits to the Wurst Kitchen are alike. I have been pleased to find new sausages and various preparations over several visits. First of all, the sausages themselves are utterly fantastic. They feature excellent quality meat (you can really taste the difference), and the delicious snap of a natural casing that sets a great sausage apart from the rest. Although sausages are theoretically heartier fare, I find these sausages to actually taste quite light. They are moist and juicy without being too heavy on the arteries. In all honesty, I heartily prefer these sausages to the famous (and also housemade) ones at Daniel Boulud's DBGB in New York City, which to me taste heavier and just don't blow me away quite as the links at the Wurst Kitchen do. 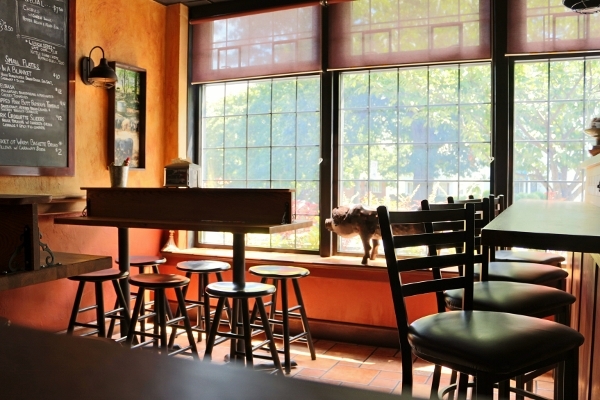 Additionally, it's important to note that there is a minor difference between ordering from the Wurst Window outside, or the Wurst Kitchen inside. If you're sitting outside, you will get the same delicious sausages available inside, but the wursts there aren't served with any sides. If you order your sausages indoors, you get a special treat: a small scoop of delicious potato salad. This potato salad does accompany sandwich orders outside, but just not the dogs. Something to keep in mind. 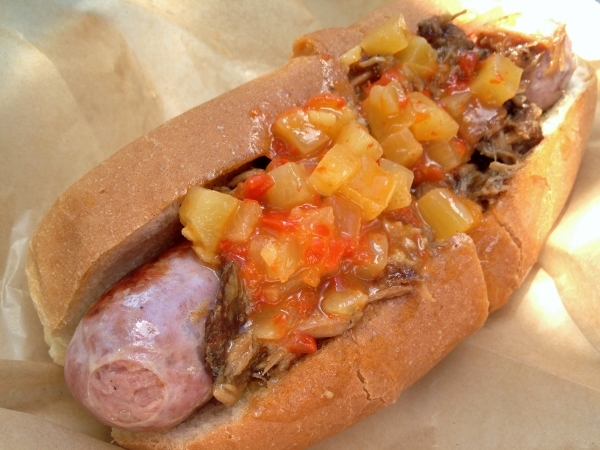 One special I enjoyed earlier this summer was a Peking-style sausage topped with smoked rib ragout and peppadew pepper-pineapple relish. It had a great sweetness from the ragout and relish that balanced the savoriness of the sausage really well. Another excellent sausage I have tried here plays on the savory-sweet combination again, but this time uses molasses baked beans atop the dog to get its point across. This is one of my favorite flavor combinations I've tried so far. 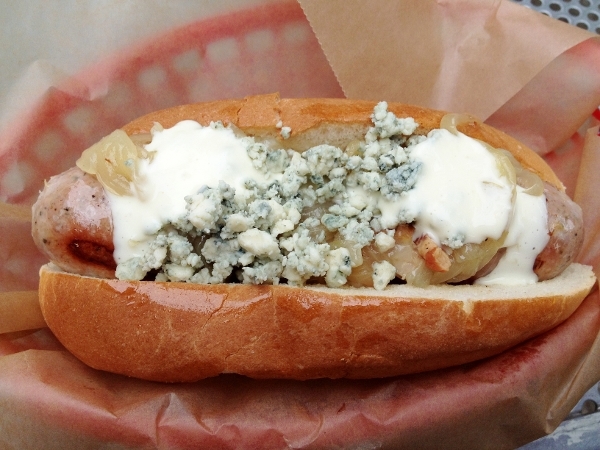 I also loved the Thuringer bratwurst topped with bacon onions, blue cheese and aioli. It is perhaps one of the heavier options I've tried, but worth every decadent bite. The hot link regularly makes the menu as well, and is always featured in a variety of outfits. 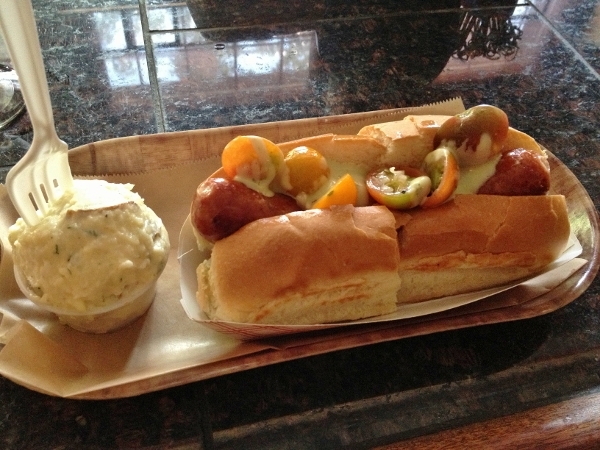 I recently enjoyed this spicy dog topped with macerated cherry tomatoes and basil aioli. It had a really nice freshness and sweetness that offset the otherwise peppery sausage. 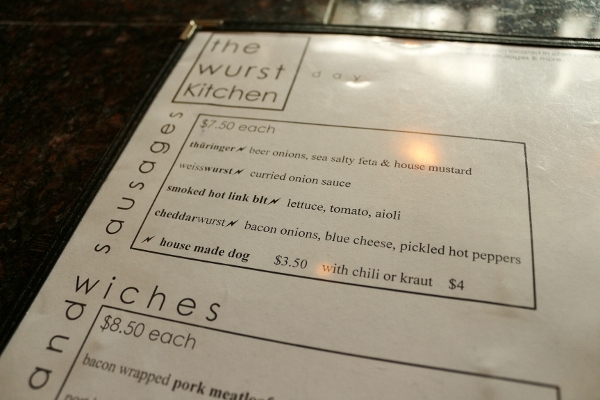 Not all of the meats featured on the Wurst Kitchen menu are pork (although predominantly they are). Occasionally a rabbit or poultry-based sausage will make the cut, and I highly recommend giving these a try as well. I really enjoyed the rabbit and Dijon sausage with beer-braised onions and feta cheese that also made an appearance on a recent lunch menu. Furthermore, last week a brand new sausage hit the menu and I anxiously tried it out myself. 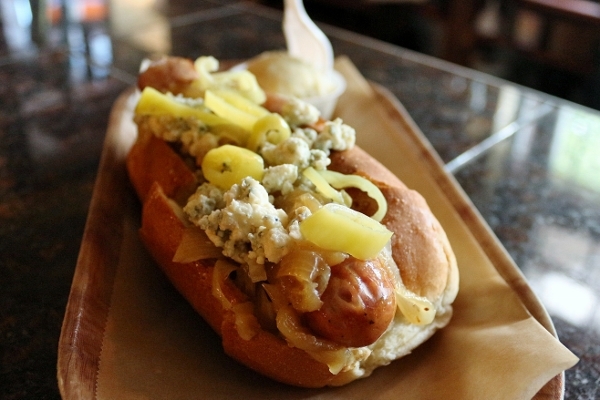 The Cheddarwurst (yup, there is cheddar cheese infused into the sausage... like magic) is topped with bacon onions, blue cheese, and pickled hot peppers. What a fantastic addition to an already great array of sausages. The cheddar flavor is quite mild (especially in comparison to the blue cheese), but it adds a decadent, extra unctuous texture to every bite. Cheese was meant to be stuffed into things. This is a great example. 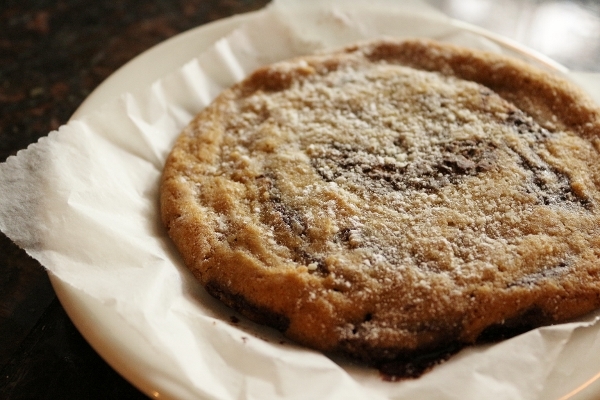 A sweet finish to the meal can be found in the form of a pretty great salty chocolate chip cookie. Chocolate coins are used instead of chips, and the pan of cookies is pounded on the counter after baking to give them a flat look. 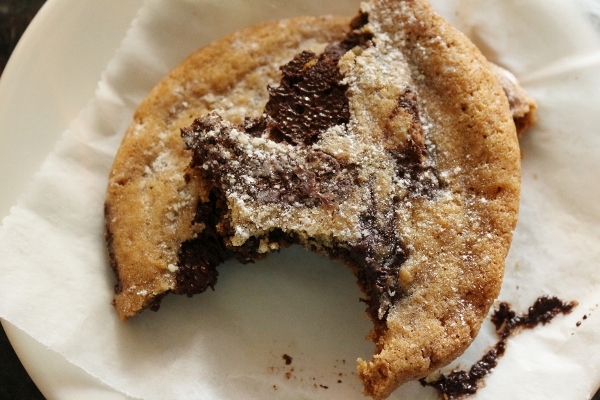 A little crunchy and a little chewy, they're a solid bet with a nice layer of chocolate in the middle. Additionally, a nougatine glacé with bacon cookie crumbs, and caramel and chocolate pudding round out dessert options. 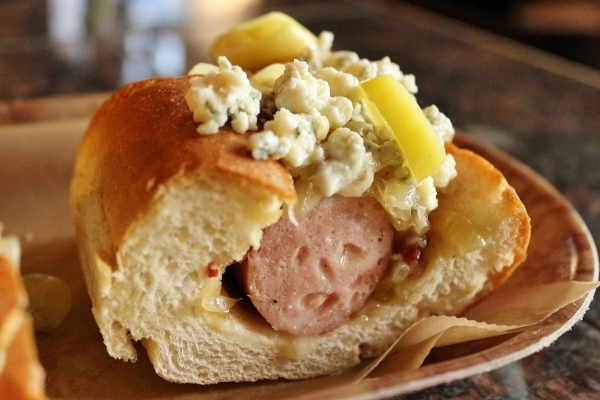 So far, I have only experienced what daytime at the Wurst Kitchen has to offer, which includes dogs on buns. At dinner, all bets are off and these housemade links are served naked (sans buns) with a variety of accompaniments to suit each item. Perhaps at some point down the line, I will visit after dark, but for now the Wurst Kitchen has a monopoly on my stomach at lunchtime, and that's where you'll find me. At the bar stuffing my face with porky deliciousness. 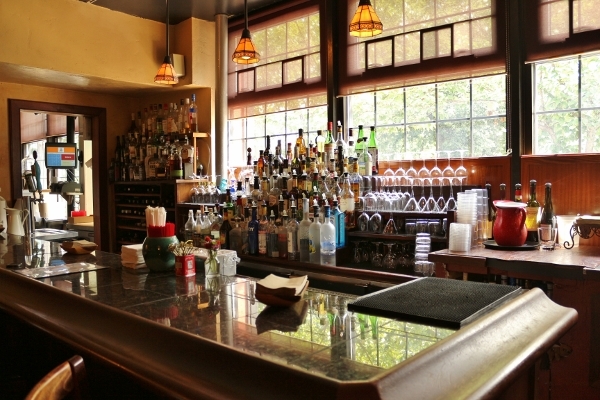 The Wurst Kitchen is open Tuesday through Saturday. For full hours of operation, please see the Chez Pascal website.